Do I knit? 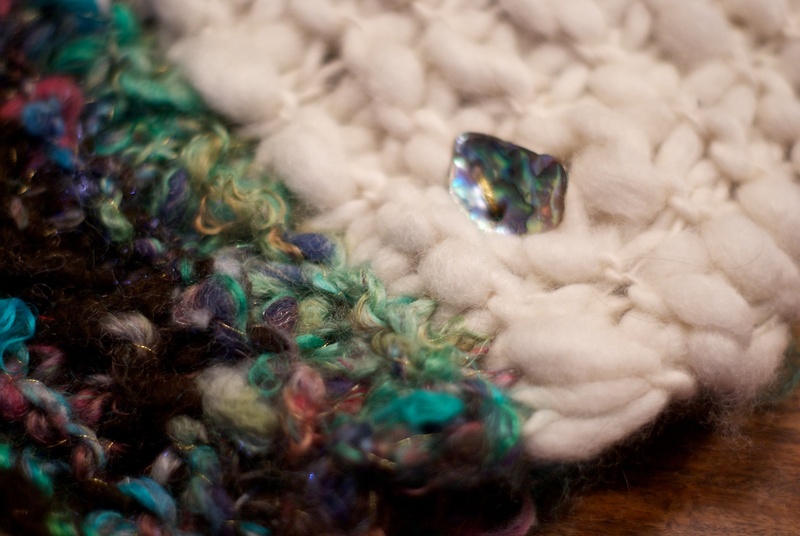 No, not really 🙂 But this was a really simple project that turned out pretty well, as in, wearable, with no dropped-stitch-holes, and straight edges – a triumph on needles for me! 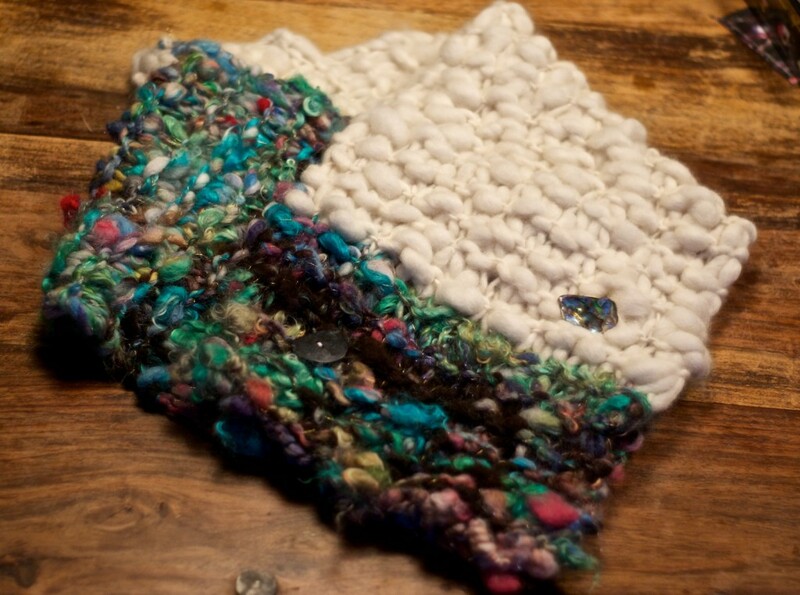 To make this I used some of my super puff thick and thin in white, and a small skein of a blended art yarn (like this one). I also used two mismatched big buttons. It was really simple to make (obviously because ‘I’made it). I cast on about 18-20 stitches and then just knitted (garter stitch) as you would for a straight scarf. 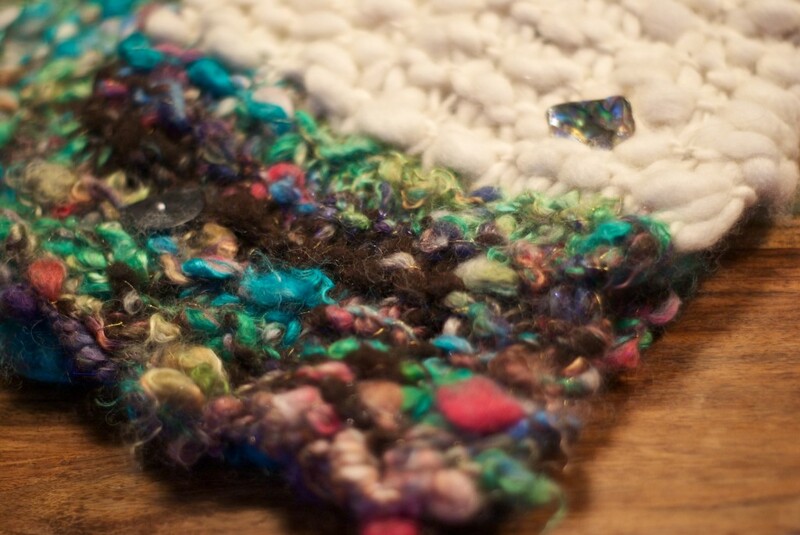 I started with the art yarn and made a block of that, then changed to the thick and thin. When I figured it was almost long enough I used up the rest of the art yarn so both ends of it have the colour and texture, but its asymmetrical, as in, the blocks of this colour are different lengths. I added the buttons on with the ends crossed over each other, so it fastens across the front. I don’t know exactly what the finished length was, but you just need to make sure its long enough to sit comfortably around your neck and the ends meet nicely across your chest. This was a gift for a friend, and it looked fantastic on her! I was so happy about that 🙂 It was also super fast to make, I think it took me an hour to knit on size 35 (19mm) needles. The thick and thin makes it especially cuddly, soft, and really cosy to wear. 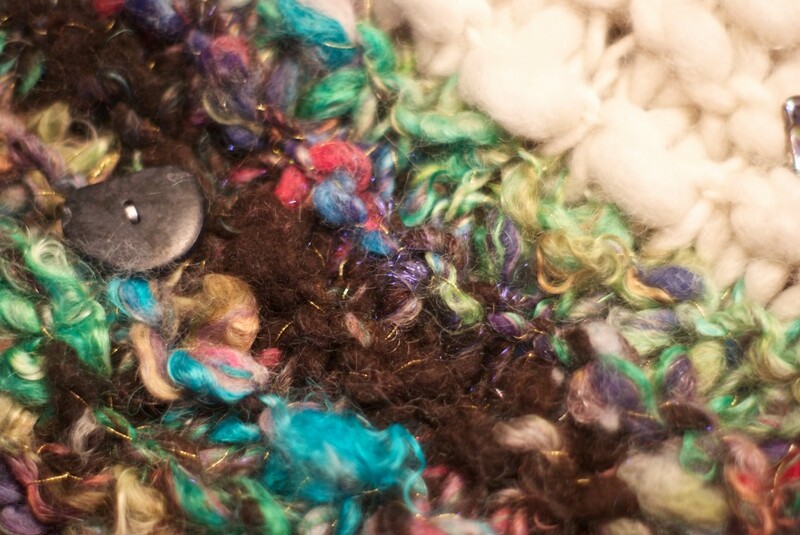 I liked the texture contrast with the art yarn too, and its a good way to use a smaller skein of very textured, colourful yarn without it being overpowering in the finished item. This is what I like about knitting: its really fast when you use bulky yarns. When it works, it is very satisfying and I always get a great sense of achievement from it! Its possible to make something super simple like this yet have a really nice wearable piece when its done. What I like about art yarns, they add some pretty melody to my otherwise gregorian chant style knitting skills. This is a beautiful gift. I love the colors ! So simple, yet never thought of it, I guess that’s called brilliance! Yay for you. Lol. Omg. Your wool is stunning !!! !